African Americans and American Jews have interacted throughout much of the history of the United States. This relationship has included widely publicized cooperation and conflict, and—since the 1970s—has been an area of significant academic research. The most significant aspect of the relationship was the cooperation during the civil rights movement, culminating in the Civil Rights Act of 1964. But the relationship has also been marred by conflict and controversy involving subjects such as the Black Power movement, Zionism, affirmative action, and the roles of Jews in the slave trade. Jewish producers in the United States entertainment industry produced many works on black subjects in the film industry, Broadway, and the music industry. Many portrayals of blacks were sympathetic, but historian Michael Rogin discusses how some of the treatments could be considered exploitive. 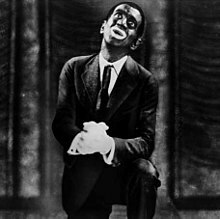 Rogin also analyzes the instances when Jewish actors, such as Al Jolson, portrayed blacks in blackface – Rogin asserts that these portrayals were not overt racism, but simply a reflection of the times, since Blacks could not appear in leading roles at the time: “Jewish blackface neither signified a distinctive Jewish racism nor produced a distinctive black anti-Semitism”. Black academic Harold Cruse viewed the arts scene as a white-dominated misrepresentation of black culture, epitomized by works like George Gershwin’s folk opera Porgy and Bess. Some blacks have criticized Jewish movie producers for portraying blacks in a racist manner. In 1990, at a NAACP convention in Los Angeles, Legrand Clegg, founder of the Coalition Against Black Exploitation, a pressure group that lobbied against negative screen images of African-Americans, alleged that “the century-old problem of Jewish racism in Hollywood” denies blacks access to positions of power in the industry and portrays blacks in a derogatory manner: “If Jewish leaders can complain of black anti-Semitism, our leaders should certainly raise the issue of the century-old problem of Jewish racism in Hollywood…. No Jewish people ever attacked or killed black people. But we’re concerned with Jewish producers who degrade the black image. It’s a genuine concern. And when we bring it up, our statements are distorted and we’re dragged through the press as anti-Semites.” Professor Leonard Jeffries echoed those comments in a speech in 1991 at the Empire State Black Arts and Cultural Festival, in Albany, New York: Jeffries said that Jews controlled the film industry, using it to paint a negative stereotype of blacks. After Israel occupied Palestinian territory following the 1967 Six-Day War, some American blacks supported the Palestinians and criticized Israel’s actions, for example by publicly supporting Palestinian leader Yassir Arafat and calling for the destruction of the Jewish state. Immediately after the war, the editor of the Student Nonviolent Coordinating Committee’s (SNCC) newsletter wrote an article criticizing Israel, and asserting that the war was an effort to regain Palestinian land and that during the 1948 war, “Zionists conquered the Arab homes and land through terror, force, and massacres”. This article led to conflict between Jews and the SNCC, but black SNCC leaders treated the war as a “test of their willingness to demonstrate SNCC’s break from its civil rights past”. The counterpoint to black antisemitism is Jewish anti-black racism. Some black customers and tenants felt that the Jewish shopkeepers and landlords treated them unfairly or were racist. Historian Taylor Branch in his 1992 essay “Blacks and Jews: The Uncivil War”, asserts the Jews have been “perpetrators of racial hate”, citing the example where three thousand members of a sect of Black Jews from Chicago were denied citizenship under the Israeli law of return because of anti-Black sentiment among Israeli Jews. Branch was criticized by Seth Forman, who said the claims seem baseless, particularly in light of Israel’s airlift of thousands of black Ethiopian Jews in the early 1990s. A group of American civil rights activist led by Bayard Rustin investigated and concluded that racism was not the cause of Black Hebrews’ situation. This entry was categorized in Black-Jewish Relations, PREJUDICE, RACISM AND ANTI-SEMITISM and tagged in Affirmative Action, Civil Rights Act of 1964, Civil Rights Movement, Palestine, slave trade, Student Nonviolent Coordinating Committee, Yasser Arafat, Zionism on March 11, 2013 .